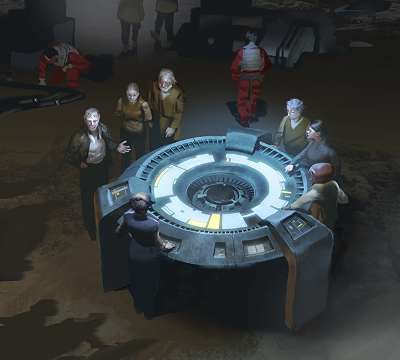 Intent: To submit a new base of operations for the Alliance-in-Exile for when it moves forward as a minor faction, and also to solidify its ties with its affiliated major the Outer Rim Coalition. Population: With its expanded subterranean network, the base is able to house and support a large amount of personnel while still maintaining secrecy. Several battalions of Alliance troopers are quartered here in case High Command should need to wage a fighting retreat, including a significant special forces minority. The rest of the Alliance's personnel consist of their remaining leadership hierarchy as well as eight combat squadrons of pilots, technicians, medical professionals and other noncombatants. Accessibility: D'Qar Base is for now hidden to all but those who have proved their loyalty to the Alliance beyond a shadow of a doubt, as well as a few trusted allies within the Underground. It is camouflaged by its surrounding terrain and with only a few hangars, satellite dishes, and a shield generator visible from the sky. Stragglers from former GA space or those still looking for some reason to join up can find the beginning of a path at the Galactic Alliance Embassy on Terminus, the only surviving branch of the government's public federal apparatus. Description: From the surface and lower atmosphere, D'Qar Base is not much of a sight to behold which is precisely the point. Only a few surface hangars and the base's shield generator are above ground, with much of the base proper consisting of a tunnel network interspersed with artificial caverns. Originally constructed by the Coalition and based off of the original rebel base's design, the Alliance-in-Exile has expanded out underground, employing skilled Sullustan diggers to fashion a barracks and additional hangars. Most of the equipment set up is designed to be as portable as possible, just in case there is ever the need for an emergency evacuation. Beating heart of all Alliance-in-Exile operations, the command center of D'Qar Base is scaled up slightly from its old rebel alliance days, but not by much. Covered in portable communications and sensor equipment, including a central holographic command interface, this nerve center is where High Command meets and plans. It is also used for operations briefings by both the base's assigned squadrons and Alliance Intelligence. From the sheer scale of the challenges they face and those in need of their help, there is never an hour of the day when this part of the base is not a buzzing hive of activity. There is a small passage from the command center up to the ruins on the surface which it sits directly underneath for evacuation purposes. A fully staffed and stocked medical center, for now the Alliance-in-Exile's supplies are in good shape having salvaged what high quality medicine and tech they could during the fall. Its strained staff of professionals and Jedi healers can already tell, however, that soon enough this will no longer be the case. Inevitably, some fear they may be forced to resort to more old fashioned methods and techniques. The most significant expansion since the Alliance's arrival, due to the ingenuity of their Corps of Engineers (many of whom are ex-Sullustan Home Guard) the military has managed to expand even deeper underground and out beyond the old subterranean borders. This allows them to station additional personnel, enough to include several whole battalions of Alliance Army and Special Forces. Really more a hole in the wall than anything remotely resembling a full service cantina, this small part of the base has been sectioned off and designated for off duty recreational purposes. Maintaining a standard of morale is critical for the Alliance-in-Exile, and due to the nature of their clandestine operation here often times it can be months before personnel are rotated out either back to the fleet or onto the front lines abroad. While the underground maintenance hangars have been expanded as well in order to store additional squadrons of starfighters, surface constraints continue to limit the base's ability to scramble their air power immediately. While in total eight squadrons are stationed on site at all times, only two squadrons at a time are capable of launching from their surface hangars, with additional downtime while the next pair of squadrons are transported up from their subterranean berths. A narrow paved strip that cuts through D'Qar Base's camouflaged surface hangars on either side, this stretch is used for air traffic control as well as a landing area for shuttles and transports just dropping personnel off or supply light freighters too bulky or cumbersome to maneuver into one of the hangars under their own repulsor power. D'Qar was once an inhabited world in its ancient past, but that civilization has long since vanished, the only trace of them which remain crumbling alien ruins. With the airfield an open and tempting target for those who might discover them and wish to strike at fleeing personnel, these foundations of a long dead city are surrounded by forest, and a small passage leads directly up through a disguised hatch and out into the cover of the wilderness. A few dozen kilometers out from the airfield proper is the base's DSS-02 shield generator. Camouflaged as well as possible by its surrounding landscape, the generator is nonetheless D'Qar Base's most obtrusive feature, both visually from above and via sensor readings. It is guarded by regular Army patrols always vigilant in case Sith or Imperial agents penetrate their defenses and attempt sabotage. While not covered in deadly and powerful weapons emplacements like any GAAF base at the Alliance's height, D'Qar base is nevertheless a miniature fortress. Much of its security relies on more passive modes of defense, counting on secrecy and a low profile to keep their enemies from even knowing where to strike at them. Should that time come, however, Alliance forces are drilled regularly on evacuation operations. With multiple battalions of Alliance troopers and a scattering of camouflaged surface artillery and anti-air emplacements, as well as the base's shield generator, everything is designed to enable their soldiers to fend off a vastly superior invasion force for long enough to stage a rapid withdrawal. While D'Qar is a lush, habitable temperate world it has been unsettled in any significant numbers since its original natives disappeared millennia ago. Practically nothing is known about these locals except what few secrets can be gleaned from the ruins they left behind scattered across the planet's surface. Now little more than foundations, rough-hewn stone has been eroded by hundreds of thousands of years of exposure to the elements. When the original incarnation of the Rebel Alliance first discovered and scouted this world, they elected to build one of their hidden bases in a geographic region known as Pirate's Cove, named as such for the only other previous denizens in recent memory. Throughout the Galactic Civil War it served as an Outer Rim command post until finally the war came to a close at the Battle of Jakku. For decades after, the rebel base remained abandoned until it was commandeered by General Organa and her budding Resistance as a base of operations to take the fight to a mysterious new First Order. After the destruction of Starkiller Base, a First Imperial fleet was dispatched to D'Qar where the fleeing resistance fighters had been tracked returning to, and during the course of the evacuation the base was destroyed by orbital bombardment. For hundreds of years after D'Qar slept, untouched by the horrors of the Gulag Plague and incessant galactic war. Until one day, when the system was rediscovered by Outer Rim explorers and its coordinates were forwarded to the Underground. Quickly connecting descriptions of this world with what galactic records remained of D'Qar, the Coalition dispatched a team to rebuild the base to its original specifications. Since then it has served as a hub of Underground activity, functioning primarily as a waystation for those trusted few to rest and recuperate in relative safety. Some time after its reconstruction, D'Qar Base was donated to a collapsed Galactic Alliance as a safe world for its leadership to gather and reunite with one another without fear of Sith or First Imperial retribution. What is left of the Defense Fleet started to patrol the Ileenium system and its surrounding sectors, and eventually a reborn Alliance-in-Exile began to expand in anticipation of a more permanent stay. Military engineers, many of them former Sullustan Home Guard, excavated deeper underground, expanding the number of maintenance and storage hangars as well as adding significantly more open space to serve as a troop barracks. Now the base's subterranean living space can accommodate several full battalions of Alliance troopers. For their own protection, the Alliance leadership also installed an old refurbished DSS-02 shield generator several kilometers away from the base, willing to risk its power signature being noticed and discovered over a repeat of the structure's original fiery end. While today the vast majority of the base's full time denizens are Alliance-in-Exile personnel, as a show of their thanks High Command allows the Underground free reign and sanctuary for as long as their operatives require. As D'Qar Base continues to operate, this commingling effect continues to rub off on Alliance morale, causing a subtle shift from more rigid, professional military power into more of a spacer and outlaw mentality. Edited by Jaius Sovv, 09 June 2018 - 05:14 PM. Can't wait to see it in use!